Eight beers to try for the fall season. I’ve done more “festing” than usual this year. Maybe my schedule just worked out that way, but I suspect I’ve been more motivated to get my seasonal fix of Oktoberfest-style beers because there are a bunch more breweries making really good ones. There’s also something satisfying about having a seasonal beer—only available for a limited time—that goes perfectly with the time of year. True, we don’t get much of the classic fall experience here in SoCal, but days do tend to be a bit cooler, the nights become chillier, and there are one or two trees on the 15 that have a few orange leaves. I’ll take it. Even though I fested a good deal, I still missed out on a whole bunch of what I expect were awesome fest-style beers from a number of great brewers. (They’re not all gone yet, so there’s still time!) I managed to track down a few with good availability that I knew were excellent examples so I could taste them and recommend them here. If you’ve never tried a fest-style bier—many of which are called “Märzens,” but may also be called “festbiers,” or just plain old “Oktoberfests”—I encourage you to get out there soon and do so. Even if you’re a dyed-in-the-wool hophead, a stein or two of good festbier will provide a nice palate break and put you into the fall spirit—I guarantee it. Doug Hasker, the “Lager Yoda” of San Diego, made this delicious beer in the Volksfest style, which is most common at the fests outside of the big German cities. It’s light caramel and toast on the nose with hints of banana, light bodied but full flavored, perfectly balanced, refreshing, and easy to drink. At 5.2 percent ABV, it’s also designed to be consumed from large, one-liter steins that make celebrating the season especially festive. Like Gordon Biersch’s, the Karl Strauss Oktoberfest is another perfectly executed fest beer, true to style in the Märzen tradition, which is the most common style for Oktoberfest. It’s a little darker in color and packs a touch more caramel malt character, but it’s light and lower in ABV (five percent) than most of its counterparts. For pure drinkability and clean flavors that don’t cause palate fatigue, this beer is tough to beat. Also a Märzen-influenced beer, this delicious brew displays a darker amber color, is light and crisp, and has perfect levels of toffee and bready toast with a hint of coffee—all with a typical ABV of 5.9 percent. For their October seasonal, the folk (or should I say “volk”?) at Eppig decided to do a wiesen helles. This style of festbier is Munich specific, commonly served in the fields where much of the celebrating takes place; it’s lighter and more golden, but has round, slightly sweet malt, offers crisp refreshment, and boasts a solid ABV of six percent. Eppig is the only brewery in San Diego that I know of to brew this wonderful style. The other style of beer that’s been popping up on tasting boards all over town represents the opposite end of the spectrum from the malt-forward styles of festbiers. The brut IPA, which is fermented out to be totally dry, has gained popularity quickly in these parts, and—indeed—it is a cool new take on the traditional IPA. It’s made by adding a special enzyme that extends fermentation to the point where all the sugar is eaten up and turned to alcohol. This style of beer was first brewed in San Francisco, so we have our NorCal brethren to thank for this one. The Northeast gave us the juicy, mouth-filling hazy style, but San Francisco gave us the Champagne-like version of the world’s most popular hoppy style. 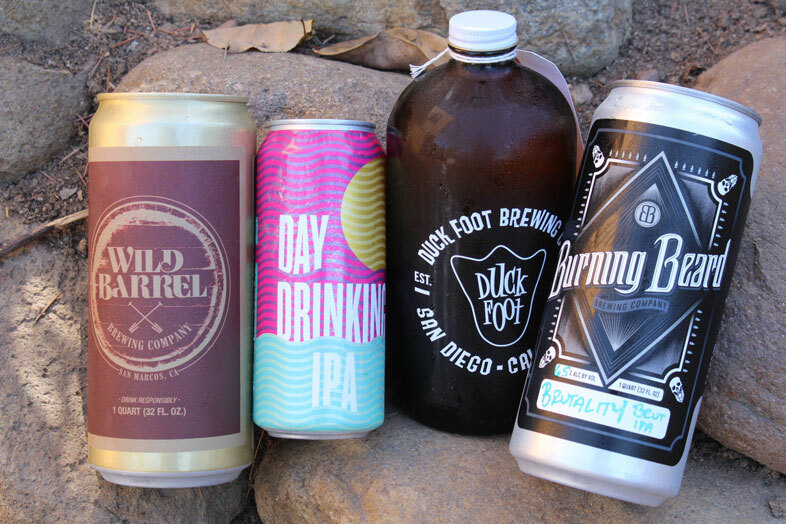 If you’re a hop lover, or hooked on hazys and want a new direction, I encourage you to seek out some of San Diego’s brut IPAs. Most deliver the character an IPA lover wants—hoppy aromas, citrus and floral notes with a slight bite—but the difference hits you in the finish. You start with the perceived fruitiness and sweetness of a little malt, but once the beer leaves your mouth, your tongue is left completely dry. These releases tend to sell out fast (there were three or four breweries that had gone through their inventory before I could get them for this article), so again, if you’re inspired, get out there soon. Here are four brut IPAs that should be relatively easy to find—I think they’ll be around for a little while. Super light and delicate, like prosecco, this is a great intro beer for non-beer types. At an amazing 3.5 percent ABV, it’s a refreshing, super-easy-to-drink beer that satisfies with nice hop flavor and ultimate sessionability. Darker in color with light dankness, this beer presents lots of great fruity and floral aromas with a touch of grapefruit and malty sweetness that dries up and disappears in your mouth as it finishes. 6.3 percent ABV. At 6.5 percent ABV, this beer is perfectly balanced between big hop aromas (Citra and Mosaic), great mouthfeel, and citrus and tropical fruit flavors. It also has a super-satisfying maltiness that simply vanishes on the tongue after you swallow. Darker apricot in color with more of a solid malt structure than many others, this IPA boasts impressive dankness, body, and mouthfeel. Try some as it warms; it opens up and transforms itself with green tea, dried fruit, grass, and wine-like character. 7.1 percent ABV. The recent availability of both these styles has been a helpful reminder to step outside one’s usual beer-drinking routine once in a while. Exposing your palate to new and interesting aromas, flavors, and textures makes you a better taster overall and often heightens your appreciation of the beers you already know and love. All eight of the beers highlighted here were tasted on the most recent episode of The Indie Beer Showpodcast. If you want to hear more tasting notes and details from me and my friends Brian Beagle, Esthela Davila, and David Martin, you can find the podcast on iTunes and at twitter.com/indiebeershow.